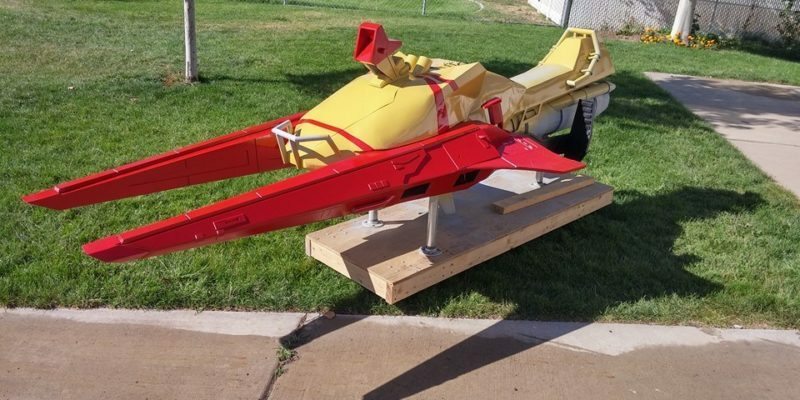 A few years ago I build a full-size (10′ long) Sparrow from the video game Destiny. A Sparrow is like a land-speeder from Star Wars, or like a motorcycle that hovers. Except mine doesn’t hover. It was made in my garage with a 2×4 lumber frame to support the weight of a rider (or several) and the skins were done with cardboard to get the shape right. After that I applied fiberglass to make the skin rigid, and then added details using various materials like MDF wood, PVC, acrylic, EVA foam, and styrene. Total weight is a little over 100 pounds, but it can support a rider, or several, of at least 500 pounds. There’s a battery in the wings and wiring throughout that will light up the gauges, displays, and engines. Made from cardboard, fiberglass, wood, lighting, LEDS, Arduino, servos, foam.